Michael Gesi is at the heart of the culture, success and effectiveness of the Okanagan Campus Security team. For Mike, keeping UBC safe has been the focus of his working life. Mike started working 28 years ago as a security guard on the Vancouver campus, before joining the Okanagan campus in 2008. Because of the strength of personal relationships he has built, Mike is known across campus, and is for most people the first point of contact for all matters security. Every day, Mike looks to finding new ways to keep students, staff, faculty and the public safe and secure at the Okanagan campus. Mike is also responsible for the delivery of all on-campus first aid, having attended more than 300 different first aid calls, ranging from the very minor to life-threatening. In addition to his work at UBC, Mike has been an active Auxiliary RCMP constable for over 14 years, as well as serving with the Lake Country Volunteer Fire Department. Bruce Gillespie is known as the ‘go-to-guy’ for on-the-spot innovation in creating and maintaining complex scientific equipment for a variety of teaching and research programs in the Faculty of Science. For over 38 years, Bruce’s resourcefulness, ingenuity and upbeat attitude have supported countless students and researchers with innovative scientific discoveries that have positioned UBC at the forefront of research in Canada and internationally. His creative approach to building customized scientific equipment has been central to publications that have appeared in top scientific journals. Bruce knows how to ask the right questions, and bring in the right materials, to get to the heart of the equipment and technical needs across the department. Students and staff alike consider Bruce a role model, for his cheerfulness, his curiosity and creativity, and for his dedication to supporting an outstanding research environment at UBC. Margaret Leathley is not only committed to ensuring that all plan members receive their best pension benefits, she is dedicated to creating a connected and supportive community at UBC. Retirement can be the most important financial decision a person can make in their career, and Margaret does everything she can to help all retiring staff members review their pension entitlements so they can make informed decisions about their financial future on leaving the university. She has taken on countless initiatives to cultivate an inclusive and supportive office, and encourages her team to participate in events and initiatives across campus. Margaret brings her boundless spirit and good citizenship to volunteering at UBC and the wider community. At UBC, Margaret has been a Member at Large on the AAPS Executive Board for six years. She has recently stepped into the role of Co-Chair for the UBC Suicide Awareness Committee. Outside UBC, Margaret has dedicated countless hours to improve the lives of animals through increasing funding and enhancing animal welfare programs with the Richmond Animal Protection Society. For 20 years, Karen McKellin has been an advocate for the interests and needs of international students, to helping them find success in their academic careers at UBC. Karen’s foresight in recognizing developing trends in international recruitment has helped the International Student Initiative to reach ever-increasing markers of success. Undergraduate international student enrolment was almost non-existent in 1997 when she began her work, with only 450 students; enrollment has since grown to almost 10,000 international undergraduate degree students in 2016. Karen takes pride in developing her staff’s leadership and professional capabilities. 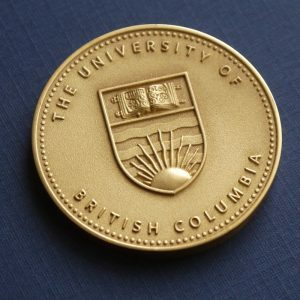 UBC and its employees are recognized as professional, relationship oriented and focused on strategic outcomes by peers at UBC and internally across the globe, and this is due, in large measure, to Karen’s leadership and her ability to empower and inspire her staff. Karen’s focus on international students has made UBC a better university. She has positioned UBC as an academic leader internationally, through the many professional relationships she and her team have developed. Jodi Scott is dedicated to providing everyone in the UBC community with the best possible physical learning spaces in which to excel. Jodi has spent her 15-year career at UBC dedicated to the wellbeing of UBC’s community by ensuring that UBC’s educational spaces work to meet the needs of students and faculty, by making sure that there are spaces on campus to support all types of learning, from informal spaces to traditional classrooms. She is a true leader to her team, and fosters relationships with partner groups across all UBC’s campuses to ensure that everyone has access to high-quality educational spaces. Jodi believes in giving back and enhancing her community. She has been an ardent United Way supporter since before her time at UBC, and this year will reprise her Co-Chair role for the 2017-18 UBC United Way Community Campaign. Congratulations Jodi, keep up the good word.